Metal detecting has always appealed to me, although I never did it as a child or teenager. The idea of finding treasure is alluring, but that for me isn’t the sole motivation. I am a fan of history, particularly anthropology, and in general what humans have been doing these past years. Finding bits of history, whether coin or relic, is interesting because it provokes the imagination; who sat there, who lived here, what were they doing and why were they here? There’s also something fascinating about the fact that day in day out people walk over a particular spot, possibly for decades, and then with just one dig, a few inches down, a piece of history is unearthed. And so, a year ago, I decided to buy myself a metal detector. I tested it out in my garden and a local field in the UK, but the beeps led to dead ends. I needed to find some potentially more lucrative sites, and increase my knowledge and experience. My main intention for buying the machine was to do some metal detecting in Thailand on the beaches. Sadly I forgot to bring it when I went to Phuket last December, and most of my travel has been urban-orientated since. Then, two weeks ago, a friend suggested a trip to Hua Hin. Luckily, it was only because my wife asked me whether I was taking my beeper that I remembered to pack it the night before we left. I was excited, but being inexperienced I pretty much expected to come up short. However, the first day really surprised me. My friend suggested scoping out an area of the beach just in front of some big, old properties that line the beach; his theory being that in the past wealthy people may have relaxed there when the tide was high. Immediately we detected a few old one Baht coins, and over the following couple of hours we found some interesting bits. The most valuable find of the day was a silver pendent (925 stamped) with a pearl inside and a couple of other stones I am yet to identify. My friend is credited with that find, though, as he was holding the detector at the time. I also found a junk chain with a shell encased in rope, some ten Baht coins, a few five Baht coins and someone’s asthma medic bracelet – it’s from the UK so I’ll try and return it by calling the number when I get home. I choose to detect in the section in front of the Hilton Hotel, and about 150 metres either side. But the compact sand nearer the shoreline frustrated me; I was getting beeps at 8-10 inches that always led to nothing, and became convinced the sand or rocks below the surface contained some metal compound that I couldn’t discriminate through sensitivity. I looked around rocks, shell-laden areas and deckchairs, and found nothing. I then moved to the back of the beach again, along the wall, and found a few coins, totalling eight Baht. A guy on the beach said that occasionally a local metal detector club comes down and works the same area, so perhaps that was a factor in the finds being few and far between; apparently one of them had recently found a gold watch. But then perhaps my inexperience led me to become frustrated and too sporadic with my search. I just can’t “read the beach”, which apparently is a real skill that takes a long time. Still, my total time metal detecting in Thailand has been around 4-5 hours, and I have at least made a handful of finds, one pretty good at that. What would be cool is if next time I could go out with someone with experience who could show me some basic skills. I think I got to grips with my detector pretty well. I am using a Bounty Hunter Quick Draw 2, which is not a high-end machine but a solid entry machine for newbies and occasional hobby hunters. It gets good reviews and has good auto-detecting functionality, a plus for those who want to get straight into the treasure hunt. It is also reasonably priced. I will take this experience and hopefully get out treasure hunting again soon. 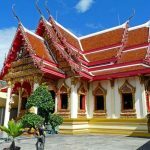 I am interested in other potential detecting sites in Thailand, and any clubs there might be. 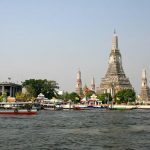 I doubt there’s anywhere in Bangkok to detect, so I guess beaches are the main attraction for expats and travellers metal detecting in Thailand. Any tips and advice is more than welcome. Hi. Is there anywhere in Chiang Mai where I can hire, or buy 2nd hand, a metal detector. I have never seen detectors for sale in Thailand, not sure about Chiang Mai. I live in chiangmai and i own a detector although not for sale, what are you suggesting? Are you still looking for one ? Where are you based ? Hey Ben, metal detectors are legal in Thailand, but any relics found must be presented to the authorities. I have carried my detector in and out on three occasions; no problem. I think the major problem with transporting Metal Detectors by Air is the Batteries that Power the Detector. Lithium batteries are a big worry with Airlines at the moment that's why I never took mine to Hua Hin last year think it would be wise to check with the Carrier before you travel.Hope this Helps. That's a good point. It would have to go in the hold under the plane, I'm quite sure of that. As Brien said, just give the airline a ring and ask. Great! Thanks for all the tips. I took my detector on the plane no problem at all, although security gave it a thorough going over in the UK. As far as I know the rules for beaches are the same as in any other country; i.e., if you find relics you have to present them at the local government office or police station for further inspection.Enjoy! Hi Janine,I very much doubt there is, simply because it isn't a popular hobby here. Most guys detecting in Thailand have their own, and I've never come across a shop selling detector gear anywhere. If you find one, let me know! Hi guys. 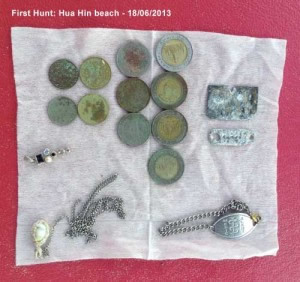 I live in Hua Hin and in the past I had brought over from the states my metal detector. I didn't know if I would have trouble using it at the beach because the police use any excuse to get money from you or take something from you so I haven't used it yet. Any feed back on this? Hi, I used mine a few times while in Hua Hin on holiday. The only problem you'll have is locals wanting to join you, all excited at the prospect of finding gold. Obviously, if you found some ancient relics, you have to declare them, and like anywhere else the usual ethical detectoring rules apply.You won't have any hassle from the police, just don't jump for joy and do a dance when you find some gold, or you'll have a number of claimants surrounding you in a flash :)I reckon it's best to go where there aren't many people around. I came here in early 90's and spent about 4 hours on a beach (secret place! I may go again!) and found two gold rings with impressive sapphire stones, each appraised over $1,000. I found a diamond necklace, four wedding bands, plain, one engagement ring that looked great but actually a fake stone (cheap-skate guy!) and dozens of earrings, nose-rings, whatever rings...and a completely rusted up pistol!I went on to other things but I am working here again, and maybe I will break out the old gold-finder soon? My advise? Think creatively. Think "body oil" and "action!" and think...If I were a ring, where would I hide?! And watch the current...water moves things quickly. Wow, you've had some great finds. I am not very experienced and still getting used to the detector. I am itching to go again but don't live near a beach! Thanks for the advice. Try this; find a sandy place and bury some items; big, small, gold, aluminum, steel (and remember cast iron and steel are quite different) then set you detector (or your ear!) to weed-out ground interference, and learn to recognize the different sounds that different metal makes at different depths. The tone changes. That will help you a lot in telling what things to dig for, and what are probably not. I usually use a wide-search large sensor to "glass" the beach first. But I don't dig it. I locate the "big ping areas," that have non-ferrous noise. Non-ferrous noise generally includes the noble elements. The deep rumbles!If the tide is out, I use a small bag of flour, toss a pinch on the hot-spots. If the sand is wet, carpenters string-line chalk in colors is great. I squeeze a little out and it makes a pattern. Then stand back and look at that pattern of marks.People are animals of habit and patterns and current does pretty much all the rest. You need to see the "collection point." Over time, things collect in the same place. You have to find it, and different weight material collects at different places.I change heads, use a small search-coil and pinpoint pockets on the "travel line" of debris. Than use a plastic spaghetti strainer and a plastic scooper...and check the diggings as I go down...soon you know if the target is in the hole or in the tailing...or in the basket. Often I will dig through a layer of aluminum junk...and then the treasure is below that. If you get good at depth reading from sound, you can pick the signal of gold under junk metal.But practice that in the sand lot. Know your machine, and you will have a lot more success. And a lot more fun!Zero-out ground interference, know the sound of the metal, and draw a pattern on the search site. And good luck! Sorry to hear that Jony. I think the best way forward would be to start a thread on Thaivisa.com asking for experienced metal detectors to come forward and help. Perhaps offer a small reward if anyone finds it. Most detectors are always keen to help out in situations like this. I hope you find it.